What would you do if you want to pursue education from Indian Institute of Management, London School of Economics or Harvard Business School, but don’t have enough funds to sponsor it? Well, an educational loan could you be your saviour! 1 What is an Education Loan? An education loan or a student loan is a loan taken to pay for the higher education of a student. It is a method of funding higher education since the cost of education increases almost every year. The history of educational loans dates back to 2001-02, when the scheme was launched after a mutual consultation between the Government of India (GOI), Reserve Bank of India (RBI) and Indian Banker’s Association (IBA) to give financial aid to students aspiring for higher education. However, it was only after the year 2005 that the educational loan started gaining popularity. In fact, the figures released by RBI in 2013 show that the amount of outstanding educational loans has risen to Rs48, 400 crores in 2012 from Rs2,986 crores in 2003, almost 15 times more in a span of 9 years. The figures only indicate that the educational loan fundings are going to be bigger and better, which is definitely good news for the students. But before you go ahead and sign an educational loan application form, you must weigh its pros and cons to understand whether you really need it. An education loan helps to fuel the educational goals of a student by financing the expenses incurred for admissions in the reputed colleges or universities. This loan typically includes tuition fees, laboratory fees, books, travel expenses and refundable deposit. Now that you have taken the loan, you have an option to allocate your savings to other education costs not covered under the loan or perhaps invest it to reap interest benefits. Unlike other loans, an educational loan has the option of ‘repayment holiday’, which means the borrower can wait to repay till one year after the end of the education course or six months after securing a job, whichever happens earlier. This feasibility to defer the repayment of the loan in easy installments makes it a reliable choice for parents and students. As soon as you have the admission letter in your hand, you can apply for an educational loan. Depending on the loan amount and your requirements, the bank may or may not charge a processing fee or ask for a collateral security. But you may request to waive it off as a special consideration. Nevertheless, this loan has basic eligibility guidelines, simple documentation and quick processing. An education loan not only takes care of educational expenses, but also gives tax benefits to the borrowers, thereby effectively reducing the overall cost of the loan. According to Income Tax Action, Section 80 (e), the amount paid against the interest of educational loan can be exempted for a person or his/her spouse or children for a period of eight years from the time repayment starts or the duration of the loan which is in effect, whichever is higher. Apart from the basic loan amount, several banks offer attractive cash incentives or other schemes to benefit the borrowers. For example, along with an education loan, you can avail a two wheeler loan or a personal loan for a laptop or a hostel accommodation at a special student rate. Some banks offer concessions to girl students or minority students. The interest rate on an education loan usually varies between 10 – 15%, depending on the bank and loan amount. However, rate fluctuations during the loan period can make an education loan an expensive affair for you. The banks and other financial institutions devise loans in such a way that it is profit bearing for their business. In case, you do not gather proper knowledge about the entire process or compare and contrast between different loan options, you may feel cheated on some clauses, especially those related to cancellations or default payments. In case, you can’t get a job after your studies are over or unable to repay the loan, banks may not allow further loan deferment. And, even if they do make an exception, it would be on strict conditions and higher interest rates. 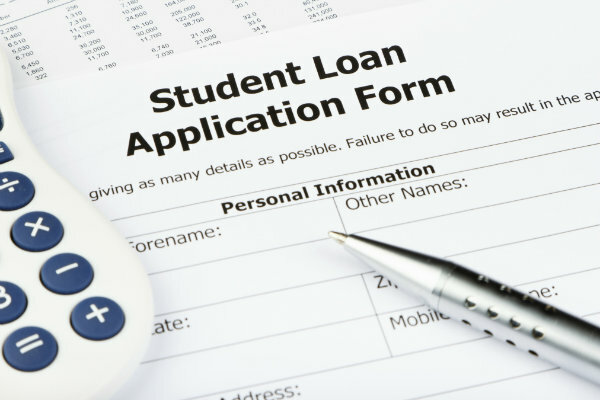 As an education loan borrower, your first step should do a thorough market research, even if requires personally visiting the banks and financial institutions to seek the information. After all, you are going to pay for it! Before you brace yourself for the loan, note down following criteria in your notebook and do a need analysis. Arrive at the total cost of the loan by listing every single, minor and major expense related to the education. Course fee, accommodation, travel, books, laptop, food, daily commuting, equipments – don’t forget anything (even your pocket money!). Can you bear the entire education cost yourself? If not, then how much can you pay from your pocket or your parents’ funds? This will give you an idea about how much you want to borrow from the bank. Do your homework by comparing education loan schemes offered by various banks on these parameters – minimum loan amount, processing fee, interest rate, documentation, repayment & cancellation terms, what types of courses & expenses does the loan cover, discounts & concessions, need for security & guarantor or are there any other lucrative scheme. This exercise should tell you, whether you are doing the right thing in applying for the loan. An education loan is your key to funding higher education, with or without a scholarship. Hence, it is very important to reap optimum benefits of the loan and ensure it is not a burden, rather a relief for you. This is an awesome post and makes every doubt clear about Education loan. These days travelling abroad for higher education (MS) has very common. And the cost of MS has increased such a way that there is no option for some one to fund that education by own. The best way is to take a education loan and during study you can do part time work to earn few bucks, which further help you to repay the education loan. If you we talk about similar situation in India, I think one have to totally depend up on the job they will get after completing the course. As part time working facility is not available so easily. You should have an agent that is famaliir with the short sale process guide you through this. I wouldn’t offer fair market value since the lender is almost always going to counter your offer. The price the lender will accept depends on different factors, such as what type of loan it is.You can take the fair market value and offer a bit less. Once the lender does the BPO, you will have a better understanding of what they are looking to net.If your offer is not accepted at first, they will just counter your offer. You then decide if that’s a number you are willing to come up towards.References : Was this answer helpful?